Desmoglein 2 depletion leads to increased migration and upregulation of the chemoattractant secretoneurin in melanoma cells. During development and progression of malignant melanoma, an important role has been attributed to alterations of cell-cell adhesions, in particular, to a "cadherin switch" from E- to N-cadherin. We have previously shown that a subtype of melanoma cells express the desmosomal cadherin desmoglein 2 as non-junction-bound cell surface protein in addition to classical cadherins. To study the role of desmoglein 2 in melanoma cells, melanoma lines containing high endogenous amounts of desmoglein 2 were depleted of the protein by RNA interference. Transwell migration and scratch wounding assays showed markedly increased migration upon desmoglein 2 suppression whereas proliferation and viability remained unaltered. In gene expression profiles, desmoglein 2 depletion was associated with overexpression of migration-related genes. Strongest overexpression was found for secretogranin II which has not been reported in melanoma cells before. The bioactive peptide derived from secretogranin II, secretoneurin, is known to exert chemoattractive functions and was demonstrated here to stimulate melanoma cell migration. In summary, we show that desmoglein 2 expression attenuates migration of melanoma cells. The mechanism of desmoglein 2 impaired cell migration is mediated by downregulation of secretogranin II. Loss of desmoglein 2 increases expression of secretogranin II, followed by an enhanced migratory activity of melanoma cells. Our data add a new pathway of regulating melanoma cell migration related to a desmoglein 2 - secretogranin II axis. Peitsch WK, Doerflinger Y, Fischer-Colbrie R et al., PLoS One. 2014 Feb 18;9(2):e89491. doi: 10.1371/journal.pone.0089491. eCollection 2014. Decreased cerebrospinal fluid secretogranin II concentrations in severe forms of bipolar disorder. Jakobsson J1, Stridsberg M, Zetterberg H et al., J Psychiatry Neurosci. 2013 Jul;38(4):E21-6. doi: 10.1503/jpn.120170. Dysregulated expression of secretogranin III is involved in neurotoxin-induced dopaminergic neuron apoptosis. The neurotoxins paraquat (PQ) and dopamine (DA or 6-OHDA) cause apoptosis of dopaminergic neurons in the substantia nigra pars compacta (SNpc), reproducing an important pathological feature of Parkinson's disease (PD). Secretogranin III (SCG3), a member of the multifunctional granin family, plays a key role in neurotransmitter storage and transport and in secretory granule biogenesis, which involves the uptake of exogenous toxins and endogenous "toxins" in neuroendocrine cells. However, the molecular mechanisms of neurotoxin-induced apoptosis in dopaminergic neurons and the role of SCG3-associated signaling pathways in neuroendocrine regulation are unclear. To address this, we used PQ- and DA-induced apoptosis in SH-SY5Y human dopaminergic cells as an in vitro model to investigate the association between SCG3 expression level and apoptosis. SCG3 was highly expressed in SH-SY5Y cells, and SCG3 mRNA and protein levels were dramatically decreased after PQ treatment. Apoptosis induced by PQ is associated with caspase activation and decreased SCG3 expression, and restoration of SCG3 expression is observed after treatment with caspase inhibitors. Overexpressed SCG3 in nonneuronal cells and endogenous SCG3 in SH-SY5Y cells are cleaved into specific fragments by recombinant caspase-3 and -7, but the fragments were not detected in PQ-treated SH-SY5Y cells. Therefore, SCG3 may be involved in apoptosis signal transduction as a caspase substrate, leading to loss of its original biological functions. In addition, SCG3 may be a pivotal component of the neuroendocrine pathway and play an important role in neuronal communication and neurotransmitter release, possibly representing a new potential target in the course of PD pathogenesis. Li F et al., J Neurosci Res. 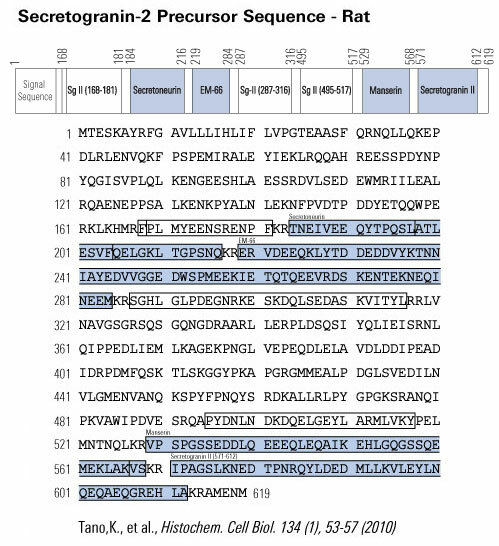 2012 Dec;90(12):2237-46. doi: 10.1002/jnr.23121. Epub 2012 Sep 18. Secretory Sorting Receptors Carboxypeptidase E and Secretogranin III in Amyloid β-Associated Neural Degeneration in Alzheimer's Disease. 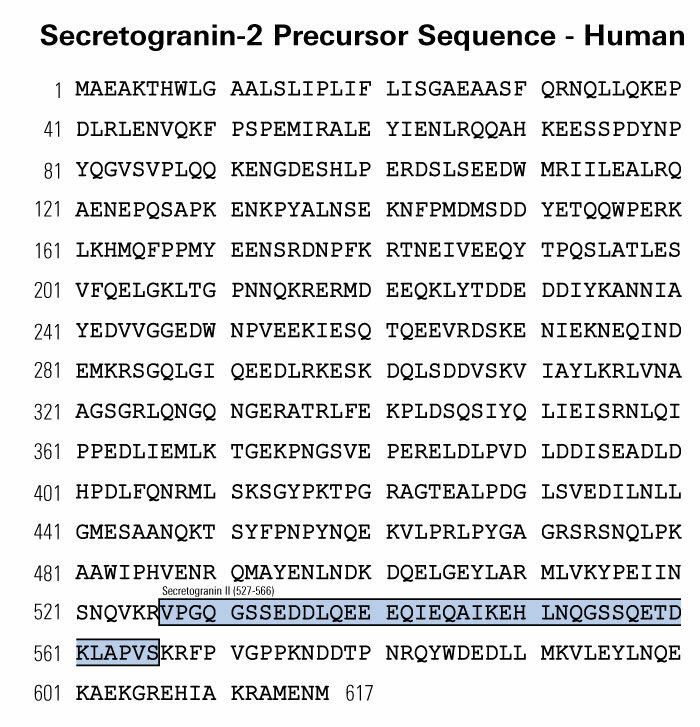 The secretory sorting receptors carboxypeptidase E (CPE) and secretogranin III (SgIII) critically activate peptidic messengers and targeting them at the regulated secretory pathway. In Alzheimer's disease (AD), the wide range of changes includes impaired function of key secretory peptidic cargos such as brain-derived neurotrophic factor (BDNF) and neuropeptides. Here, we analyzed CPE and SgIII in the cerebral cortex of AD patients and transgenic mice. In the normal human cortex, a preferential location in dendrites and perikarya was observed for CPE, whereas SgIII was mainly associated with axons and terminal-like buttons. Interestingly, SgIII and CPE were consistently detected in astroglial cell bodies and thin processes. In AD cortices, a strong wide accumulation of both sorting receptors was detected in dystrophic neurites surrounding amyloid plaques. Occasionally, increased levels of SgIII were also observed in plaque associate-reactive astrocytes. Of note, the main alterations detected for CPE and SgIII in AD patients were faithfully recapitulated by APPswe/PS1dE9 mice. These results implicate for the first time the sorting receptors for regulated secretion in amyloid β-associated neural degeneration. Because CPE and SgIII are essential in the process and targeting of neuropeptides and neurotrophins, their participation in the pathological progression of AD may be suggested. Identification of biomarkers for diagnosis and progression of MS by MALDI-TOF mass spectrometry. Body fluid biomarkers for clinical subtyping and monitoring of disease progression are of considerable interest in multiple sclerosis (MS). Proteomics tools are optimal for the unbiased simultaneous detection of large series of peptides and proteins. To identify novel candidate biomarkers discriminating patients with MS from patients with other neurological diseases (OND), and for subtyping of relapsing-remitting (RR), secondary progressive (SP) and primary progressive (PP) MS patients using a high-throughput MALDI-TOF-based mass spectrometry method. Paired cerebrospinal fluid (CSF) and serum samples of 41 RRMS, 30 SPMS, 13 PPMS patients and 25 patients with OND were analysed. Out of a total of 100 detected peptides in CSF and 200 peptides in serum, 11 peptides were differentially regulated in serum and two in CSF between patients with MS and the OND control group. Eleven peptides were differentially regulated in both serum and CSF between relapse-onset MS and PPMS patients. Lastly, four peptides were differentially regulated in serum and two in CSF between RRMS and SPMS patients. Specific peaks regulated in MS were tentatively identified as fragments of secretogranin III and complement C3. The peak intensity of the CSF peptide ion with m/z value 8607.7 correlated to atrophy (r = -0.27, p < 0.005), black hole volumes (r = 0.31, p < 0.008) and total lesion load (r = 0.34, p < 0.003). A serum peptide with m/z value of 872.4 elevated in SPMS correlated to Expanded Disability Status Scale (r = 0.341, p < 0.005) and atrophy (r = -0.286, p < 0.028). Using high-throughput body fluid profiling by MALDI-TOF mass spectrometry, small proteins and peptides were detected as promising candidate biomarkers for diagnosis and disease progression of MS.
Teunissen CE, Koel-Simmelink MJ, Pham TV et al., Mult Scler. 2011 Jul;17(7):838-50. doi: 10.1177/1352458511399614. Epub 2011 Apr 19. Cholesterol biosynthesis pathway intermediates and inhibitors regulate glucose-stimulated insulin secretion and secretory granule formation in pancreatic beta-cells. 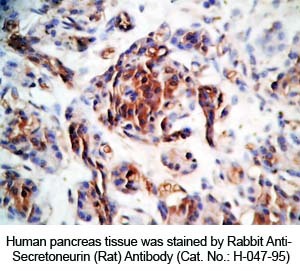 Cholesterol is reportedly abundant in the endocrine secretory granule (SG) membrane. In this study, we examined the involvement of cholesterol biosynthesis intermediates and inhibitors in insulin secretion and SG formation mechanisms. There are two routes for the supply of cholesterol to the cells: one via de novo biosynthesis and the other via low-density lipoprotein receptor-mediated endocytosis. We found that insulin secretion and content are diminished by β-hydroxy-β-methylglutaryl-coenzyme A inhibitor lovastatin but not by lipoprotein depletion from the culture medium in MIN6 β-cells. Cholesterol biosynthesis intermediates mevalonate, squalene, and geranylgeranyl pyrophosphate enhanced glucose-stimulated insulin secretion, and the former two increased insulin content. The glucose-stimulated insulin secretion-enhancing effect of geranylgeranyl pyrophosphate was also confirmed in perifusion with rat islets. Morphologically, mevalonate and squalene increased the population of SGs without affecting their size. In contrast, lovastatin increased the SG size with reduction of insulin-accumulating dense cores, leading to a decrease in insulin content. 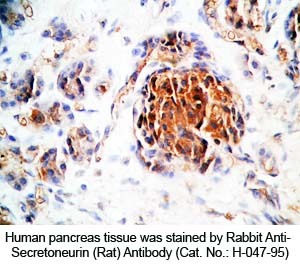 Furthermore, insulin was secreted in a constitutive manner, indicating disruption of regulated insulin secretion. 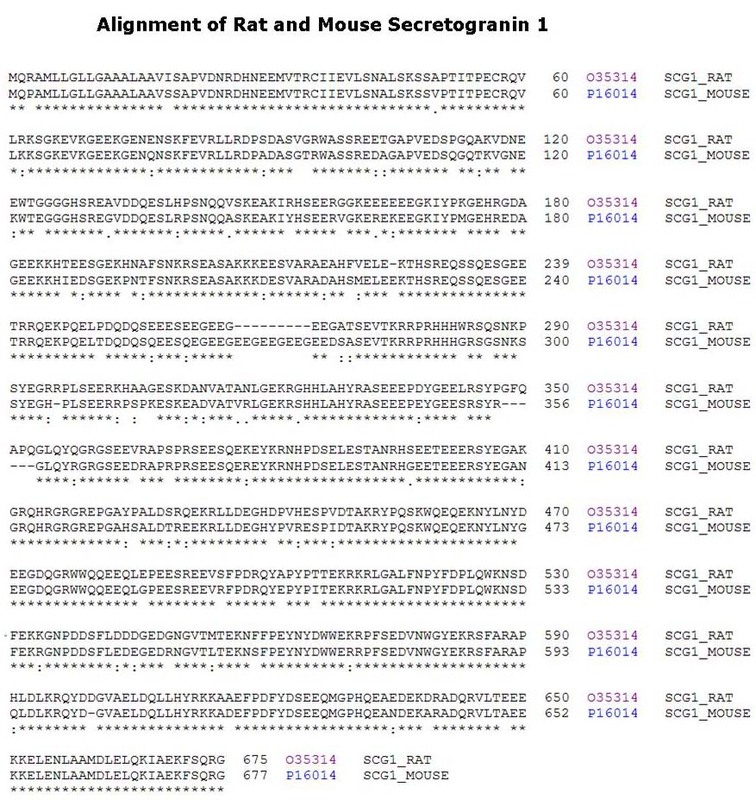 Because secretogranin III, a cholesterol-binding SG-residential granin-family protein, coincides with SG localization based on the cholesterol composition, secretogranin III may be associated with insulin-accumulating mechanisms. Although the SG membrane exhibits a high cholesterol composition, we could not find detergent-resistant membrane regions using a lipid raft-residential protein flotillin and a fluorescent cholesterol-Si-pyrene probe as markers on a sucrose-density gradient fractionation. We suggest that the high cholesterol composition of SG membrane with 40-50 mol% is crucial for insulin secretion and SG formation functions. Tsuchiya M, Hosaka M, Moriguchi T et al., Endocrinology. 2010 Oct;151(10):4705-16. doi: 10.1210/en.2010-0623. Epub 2010 Aug 4. Induction of postnatal vasculogenesis, the mobilization of bone marrow-derived endothelial progenitor cells and incorporation of these cells into sites of blood vessel formation, is a well-known feature of angiogenic cytokines such as vascular endothelial growth factor. We hypothesized that the angiogenic neuropeptide secretoneurin induces this kind of neovascularization. Secretoneurin induced mobilization of endothelial progenitor cells to sites of vasculogenesis in vivo in the cornea neovascularization assay. Progenitor cells were incorporated into vascular structures or were located adjacent to them. Systemic injection of secretoneurin led to increase of circulating stem cells and endothelial progenitor cells. In vitro secretoneurin induced migration, exerted antiapoptotic effects, and increased the number of these cells. Furthermore, secretoneurin stimulated the mitogen-activated protein kinase system, as shown by phosphorylation of extracellular signal-regulated kinase, and activated the protein kinase B/Akt pathway. Activation of mitogen-activated protein kinase was necessary for increase of cell number and migration, whereas Akt seemed to play a role in migration of endothelial progenitor cells. These data show that the angiogenic neuropeptide secretoneurin stimulates postnatal vasculogenesis by mobilization, migration, and incorporation of endothelial progenitor cells. Kirchmair R, et al. Circulation. 2004 Aug 31;110(9):1121-7. Epub 2004 Aug 23. SN induces angiogenesis in vivo in a cornea neovascularization assay. a and b, Representative images of slit-lamp biomicroscopy after implantation of control (a) or SN (b) pellets (P). c through f, Whole-mount images of in vivo FITC-BS1 lectin stained corneas (c and d, x40; e and f, x100) with control (c and e) and SN (d and f) pellets. White arrowhead indicates leading edge of neovascularization; red arrowhead, limbus artery; yellow arrowhead, limbus vein; and blue arrowhead, venous structure. Kirchmair R, et al. Circulation. 2004 Feb 17;109(6):777-83. We have analysed several markers for small synaptic vesicles (synaptin-synaptophysin, p65 and SV2) and large dense-core vesicles (chromogranin A, secretogranin II/chromogranin C) in the brains of patients with Alzheimer's disease, and normal controls by immunoblotting and immunohistochemistry. In comparison to age-matched controls the levels of all three synaptic vesicle markers were decreased in temporal cortex of Alzheimer patients. On the other hand, the levels of chromogranin A were increased, and those of secretogranin II lowered. This resulted in a significant increase of the ratios of chromogranin A to synaptophysin, p65 or SV2 and of that for chromogranin A to secretogranin II. These increases were significantly correlated to clinical severity of dementia and extent of neuropathological changes. By immunohistochemistry a high percentage of senile plaques was found to contain chromogranin A-reactive dystrophic neurites, whereas synaptophysin reactivity within plaques was rare. These results indicate that the number of synaptic vesicles is lowered in Alzheimer's disease, and that one component of large dense-core vesicles, i.e. chromogranin A, is elevated. We, thus, suggest that in Alzheimer's brain distinct changes occur for both types of synaptic organelles. Tips: See More Antibody Stainings, Immunoassay Kits Curves and Sequences by clicking the tabs on the top.